Main Event Transportation provides chauffeured limousine and car services throughout Monterey Bay and Pacific Grove. From airport limos to wedding transportation to golf & leisure transportation, Main Event Transportation provides it all in Southern California. We offer door-to-door car services in Pacific Grove, CA; you can select your pickup and drop-off points in Monterey Bay and leave the driving to us. We’re perhaps best known for our luxury airport car services to/from San Francisco Airport (SFO) and San Jose Airport (SJC). Our SFO to Pacific Grove airport limos are an affordable, luxurious, and convenient way to start any vacation or business trip. Pacific Grove is located between Point Pinos and Monterey, and is best known for its Victorian style homes and wide variety of Bed & Breakfast inns. 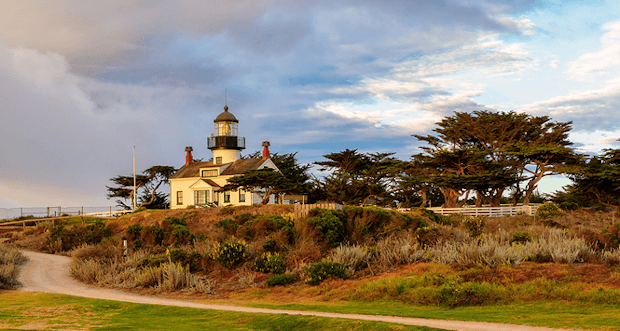 Places to see in Pacific Grove include the Point Pinos Lighthouse, Pacific Grove Museum of Natural History, and Asilomar Conference Grounds. We offer the best ground transportation services in the Bay area including corporate car services, festival transportation, wedding limos, golfing car services to Pacific Grove Golf Links, and wine tours in Napa Valley. Whether you’re looking for casual or formal transportation options in Pacific Grove, Main Event always provides a reliable, stress-free ride. Explore Pacific Grove in style with Main Event Transportation. Book your next airport car or limo service in Pacific Grove today!